“As suspected, the Marxists from the Forum of Sao Paulo are indeed partners with the Western Illuminati. 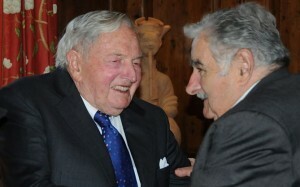 Last week, Jose Mujica, the president of Uruguay who legalized marijuana consumption in his country, met with David Rockefeller and George Soros in New York, in order to discuss strategie$$$ to expand legalization of drugs in the region. Meanwhile, crack use in Brazil has skyrocketed as has cocaine production in Bolivia and Peru. Last week, a load of 1300 kilos of cocaine was found in Paris in a plane from Venezuela. 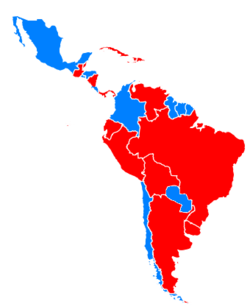 Venezuela, Bolivia and Peru (all Marxists) are huge cocaine producers. Brazil is the main consumer in the region, and Lula even gave Bolivia money in order to build what is called the Coca Highway to Brazil (because the drug helps Bolivia’s economy). The Workers Party here is behind many NGOs which fight for legalization. This week a study was issued, stating that 370,000 Brazilians are addicted to crack only in the state capitals. Here in São Paulo, the governor tried to implement a plan to force these people into health care, but the NGOs said this was “against human rights”. Now we have what is called Crackland in a large area in downtown, where they use freely, steal from people and prostitute themselves. You don’t wanna go there for a walk. According to a statement issued by the Presidency of Uruguay , Jose Mujica , 78 and David Rockefeller , 98, [met Thursday] at Rockefeller’s residence in New York and exchanged ideas concerning the process of regulation of the marijuana market in Uruguay.